What would you pay to see your precious child grow up? Please, please read my story to understand why I am continuing with my life changing fundraising. This is my only hope of spending more time nurturing my precious son, Callum. I have never asked others for help, but was persuaded that I was worthy of support. Thankfully, hundreds of people have since agreed, generously donating over £70,000 towards the £200,000 I need (equating to £240 per day over 2 years). I was deemed to be terminally ill over three years ago, but refused to accept this. I diligently researched with my husband, Jim, to find groundbreaking proven treatments. Collaborating with experts I was able to find a proven new life saving immunotherapy drug (Pembrolizumab). However, the drug company is bogged down in the bureaucracy of making such drugs routinely accessible. My request for ‘exceptional’ NHS funding was rejected and despite being raised during a recent Prime Minister’s Question Time has no prospect of being funded by the NHS in the near future. This is despite Pembrolizumab already having been made available, at no cost, for other types of cancer. There is no incentive for the system to fund early access to this drug for my rare bowel cancer sub-type and no means of changing this. Believe me, I have tried. Therefore, my immediate focus is on fundraising to cover the two years of treatment required (I do intend to continue campaigning for other deserving families too). With fantastic local support, over £70,000 has been raised over a few short months. Hence, a local Professor of Oncology, was able to start my private immunotherapy treatment, on 1 December 2017, at my local hospital, Castle Hill. Words are insufficient to express how grateful I am to everyone who has contributed. They have made my family’s dream a reality; the gift of extending my life. I am feeling better than I have for years. But I need to continue raising money to cover the full costs of treatment. After 3 years of fortnightly palliative chemotherapy, there was no other option but immunotherapy for me. It also became very obvious that the NHS approvals system is much too slow and inflexible. Therefore, I am campaigning for this revolutionary drug to be made urgently available for other deserving families who find themselves, through no choice of their own, in a similar position to me. 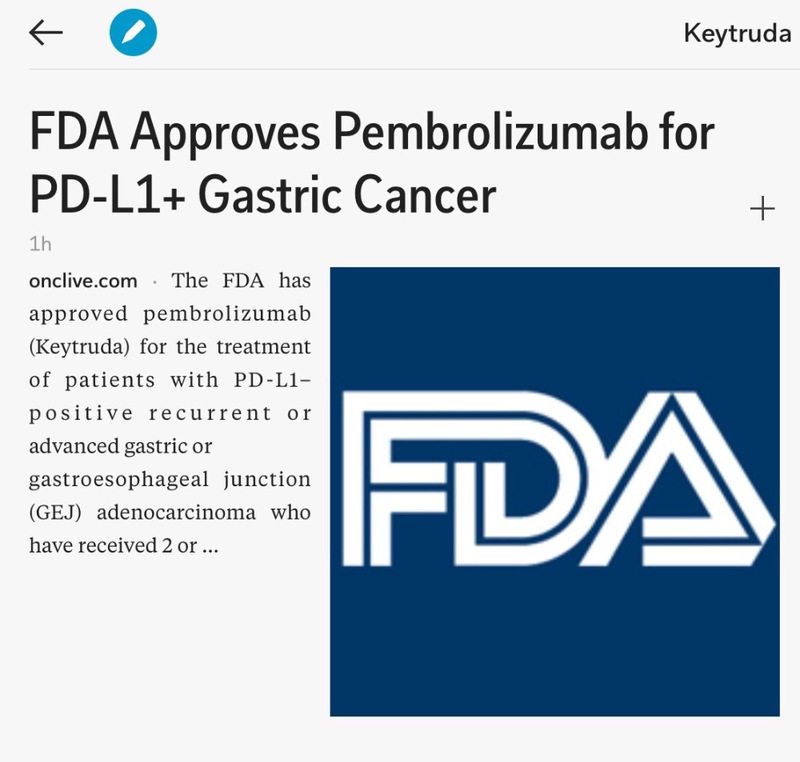 Pembrolizumab, has been approved in America for over a year now for a very wide range of ‘solid’ MSI-high cancers, which includes my rare cancer sub-type. This was based on a set of startlingly successful results in clinical trials, with some patients even taken out of hospices to resume a normal family life! My collaborative research with experts has also confirmed that this is my only real hope for a longer life or even a possible cure. Well respected senior NHS consultants agree with me that this is my best option, but they cannot yet obtain funding from the NHS. The NHS has chosen initially to make Pembrolizumab available to only a relatively small number of cancer patients. Limiting the cost implications, until the NHS can agree better prices? This process will be too late for me and many others. Is this fair? Would you accept this if you were in my position? After many months of exploring every possible way to obtain this drug from the NHS, as some are privileged to do, I have met with nothing but stalling tactics and almost literally ‘dead ends’. I felt compelled to begin the treatment, without all the funds in place, fearing my health was deteriorating too much. Fundraising has been hard work, humbling and life changing. Having started treatment, I am freed from the tyranny of the bi-weekly chemotherapy I had endured for the past three years. When I am able I will continue to campaign for access to this groundbreaking treatment, for the sake of all the other deserving families. Having relied on the generosity of family, friends, ex-colleagues and kind hearted members of the public, I have been truly humbled how much people care. The response has been totally overwhelming and heartwarming, from all ages and walks of life, including from my ex-nursing colleagues and from many people who do not even know me. Many successful fundraising events have been held, by my fantastic friends, with many more planned. But, I do still have a long way to go to cover the full treatment costs. I Would be very grateful if you could please carefully consider becoming one of my supporters. As well as helping to save me, you will also be helping to bring the kinder future of cancer care into the lives of countless other families devastated by this terrible disease. I became friendly, via his selfless cancer help blog, with Tom Marsilje, an American cancer drugs researcher and fantastic patient advocate, who was also a fellow stage IV bowel cancer patient. Tom took the trouble to educate me about the possibilities emerging from the fast developing area of immunotherapy. I will be forever in Tom’s debt and following his recent death wish to honour his memory and be part of his legacy. He stressed the need for me to get a new cancer tumour test done. This would reveal if I had a rare highly mutated cancer sub-type, classified as having Micro Satellite Instability: termed as MSI-High status. I hit the jackpot! My test showed that I did indeed have a rare highly mutated cancer sub-type. Tom then revealed that MSI-High cancers were responding really well in the latest trials to the immunotherapy treatments, in this case the drug pembrolizumab. The mutations could be used to good effect by the drug to reveal the cancer to my powerful immune system for attack. Early results were stunning the scientific community and the race was on to translate this to patient care. A race America is far ahead in, as they passed pembrolizumab through an accelerated approvals process. Tom always finished his blogs with “To life!” I will never forget my dear friend and the great amount of good he did in the world. My cancer story, and it is one of hope, is available for you to read on my ‘Message from Hayley’ web page at www.cure4hayley.com Please also see the resource we have put together for other families. Please also note that any funds raised will be subject to audit and will go directly to my treatment, or to immunotherapy research if I should not be able to continue. I really felt the need to update everyone who has supported me: my lovely family, friends and supporters. You gave me life and hope, by kindly making donations and supporting events. What seemed impossible suddenly became possible: the substantial funding required for my proven breakthrough treatment. I was worn out by my struggle and my reserves were low. My options were dwindling fast. The chemotherapy regime was no longer effective, meaning my spreading tumours were again growing. It was time to make the hardest decision of my life. 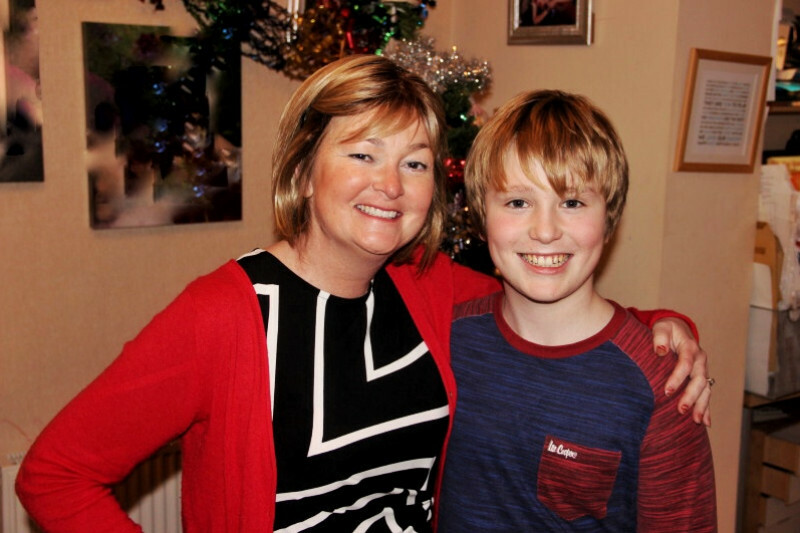 Desperately wanting to stay alive for my wonderful son Callum, now twelve years old. But sick of the fortnightly chemotherapy, wiping me out and imprisoning me on the sofa. Alive, but not part of life. When I sat with my fantastic oncologist to discuss the need to stop my chemotherapy I could barely control my emotions. Despite working for access to immunotherapy for over two years, the prospect of ending my chemotherapy frightened me to the core of my being. Especially the need for a six week break from the chemo before being allowed to start the new treatment. Knowing my cancer was already growing. The crushing fear also made me worry that I might die before the immunotherapy could start working. Falling at the last hurdle. Cruelly denied this last chance of continuing to be a mum, wife, sister, daughter and friend. Swallowing false pride and overcoming fear of failure (thanks to reassurances from friends), Jim and I launched the fundraising campaign in September 2017. Initially, I doubted whether I was worthy of the support required. I had never asked for financial support from anyone my whole life. My first paid work was as a 12 year old kennel maid and I have always liked working hard and paying my own way. It made asking people for money so hard. We kept stalling the fundraising launch as I worked through this and convinced myself that it was the right thing to do. I am so grateful we did. How could we have ever imagined such a great response. As each of the many donations were made, the total grew rapidly beyond my wildest dreams. Such fantastic support meant that, on the 1st December 2017, I was able to have my first dose of immunotherapy. Luckily in my local hospital. Starting the treatment brought with it a complete mix of emotions: fear, hope, joy, relief and gratitude. A truly life changing step. Your contributions have amounted so far to in excess of £80,000! And more enjoyable events are planned, arranged by a tireless group of supporters. I would love to list a few of my many supporters here, but who do I pick out of the many? All of the kindnesses have meant so much to me and my family. How time flies! I have already had four doses of immunotherapy, with thankfully no side effects so far. I last had chemotherapy in November and my body has recovered much more quickly than I could have ever hoped for. The clinical team will be able to make a reasonable judgement about whether the immunotherapy is working for me in the summer. A summer I am looking forward like no other. I feel so well since stopping the chemotherapy. I am living a good and full life, much fitter, mentally unburdened and sleeping well. 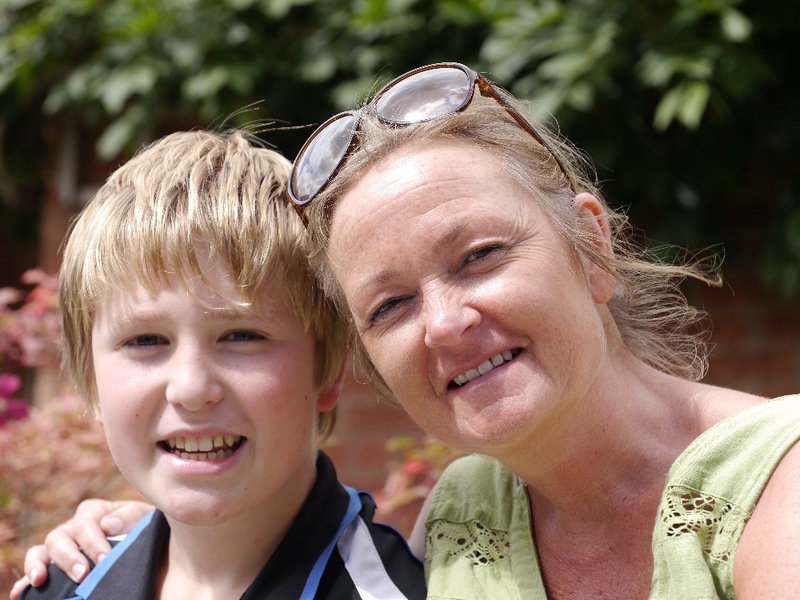 Callum recently shared his feeling at bedtime about my current health: “I’ve got my mum back”. As I hugged him with tears streaming down my face, I knew at that moment that I’d totally made the right decision. Swallowing my false pride had enabled me to ask others for support when I needed it most. Winning the one chance I had at a longer life with him. My giant leap of faith has already paid off, no matter what the future holds. I have immediately shared better days with Callum and we know we are truly surrounded by love. 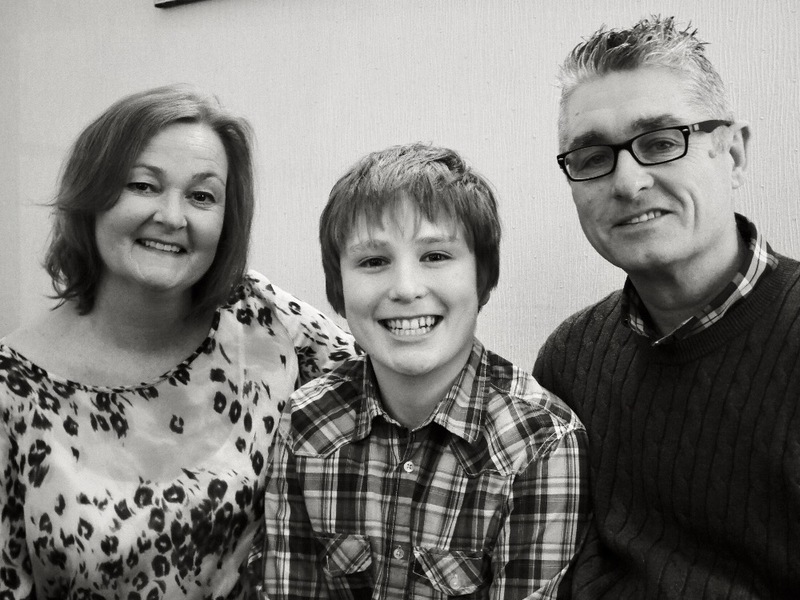 I am also really believing that I will be there to nurture Callum and see him grow into a fine young man. What can be more important? What greater gift? I feel blessed. I also desperately want to grow old with Jim. I wouldn’t be alive today if it wasn’t for him. He’s tirelessly researched a credible way through this unforgiving, cruel disease. By my side. I am so fortunte to have just celebrated my 50th birthday! A day I never thought I would see. Family and friends made sure that the milestone was an even happier one, surrounded by love, the most precious gift of all. Hope is very much alive! I want to again sincerely thank all you lovely, generous, caring people for supporting me. Together with the core group who have tirelessly organised events, made things, collected things, braved the cold, spread the word and so on. I want to stay alive not only for Jim, Callum, my family and friends. I also want the opportunity to continue giving back, ‘paying forward’ and building on my previous work. As well as directly advising some patients and starting to write a guide on fundraising, I am updating my website, www.cure4hayley.com, to be of greater value to others. I also believe that my experience of immunotherapy will help in advancing the understanding of this life giving, kinder treatment. I hope that, in supporting my fundraising, you are very proud of helping make this happen. You have made a massive difference to my family and hopefully in the longer term to other families too. From the bottom of my heart, thank you! To Life, Love, Laughter and Friendship! Words cannot express how grateful I am for the fantastically generous donations that have taken the total raised to well over £70,000. There have also been so many acts of kindness and lovely messages of support. I am about to have my second dose of the immunotherapy drug (Pembrolizumab) and feel so well. This is a combination of coming off the gruelling chemotherapy, the mental strength I have from all the outpouring of kindness, and the hope I now have. I wish you all a very Happy Christmas with your loved ones and a very happy New Year! My case just gets stronger and stronger! Almost speechless. My case just gets stronger and stronger! What will it take for those in power to listen?! Just in from America. Some remarkable results for this group of patients suffering from a very deadly form of cancer. I am absolutely delighted for them, but how would I be feeling now if people were not so kindly supporting my crowdfunding appeal. I would be facing an early death, wrenched from my wonderful son Callum, in the certain knowledge that there is a potential cure. It all feels so unreal. I did not need any more motivation, but this certainly provides some. How can this be acceptable? I am left fighting for my life after a lifetime of caring for others. What is my life worth? Strengthens my case for NHS funding! Because, being blunt, I am going to die very soon without immunotherapy (a drug called Pembrolizumab). With immunotherapy I could live for many more precious years, with few side effects. Because Jim and I are experts: we both hold masters degrees in health research;have 55 years NHS service between us; and since my cancer exploded into our lives we have made ourselves experts specifically in immunotherapy and bowel cancer, and keep in regular direct conversation with leading doctors. No. We want to see this immunotherapy, a *PROVEN* widely used drug, made available for all patients with this rare tumour sub-type (as they have done in America). On 20 September 2017 NICE approved a very similar drug for lung cancer and I am delighted for those patients. Other patients deserve this game changing treatment too. Believe me we have tried! We are constantly facing rejection and delaying tactics by the heartless people high up in the NHS, including the health watchdog Nice. It is clear that we all have a price tag on our lives! Costs are everything to them, not patient care. People should be outraged. It could happen to you or your loved ones. There should be a public inquiry. As I began, I am going to die very soon. Therefore, given the above, we were left with no other option but to fundraise. Anyone would need help with the massive £240,000 costs of the drug. Otherwise it is just too late for me. The heartless people high up in the NHS are happy to leave me with no hope (one of their letters refers to me as ‘this patient’). But now with people's generosity I could have a chance at life. But people need to donate. And I need a lot of people to do this, so sharing my webpage and convincing others is a must too. The cost works out at £260 per day for two years. Buying me more precious time with my wonderful son Callum.